I tend to go to bed early, so Rob had to wake me out of a sound sleep. 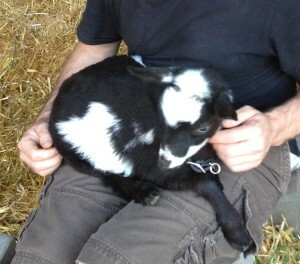 Bell is the smallest of our 4 goats. She is super sweet, and all the other goats bully her. I pulled on some clothes and went out with him, feeling that this was probably a dream. What could have hurt Bell? Rob had moved her to the shed, and she was lying on her side on the ground, her four little legs sticking straight out. She had blood on her neck, but we couldn’t find the wound in her thick hair. It wasn’t gushing, but there was a liberal amount of blood on the ground, and all over Rob’s sweatshirt. I went to check the other three goats – her brother and two big goats. Of course, the other goats took that as an invitation to come back in the shed. Not good with a wounded goat. Nothing to do but move her. We have a little back area in the shed for hay. I opened the inner gate, and Rob picked Bell up. More screaming. He lay her in the small space by the hay, and stayed to comfort her while I went to phone the vet. Note: Always have the vet in your contact list, easily found. I didn’t have that foresight, so even though it was close on 11 I called a friend who also has goats to get the livestock vet’s number. Thank goodness for emergency livestock vets! He said he’d be there in 45 minutes. Back out to the shed, where Rob sat next to Bell. She was quieter, but still looked awful: eyes open wide and rolled back, blood on her neck, stiff as a board. It was a long 45 minutes. In the meantime, Rob filled me in. He had gone out to say goodnight to the goats, and he had heard them moving around in an odd way. He turned his headlamp on, and saw an animal disappearing through the orchard – and there was Bell, in extremis. I went out and, sure enough, the electrical fence was busted in two places. Entry and exit. There was a liberal smear of blood near the exit point. At last the vet pulled up in his van/vet’s office. He looked Bell over, gave her a shot for the pain, and told us that we could most likely expect her to bounce back the next day – eating, etc. – or not. And if not, there would be some hard decisions to be made. In the meantime we should keep her warm. We tucked her between a hay bail and the wall, with a ratty old sleeping bag that we had been meaning to trash wrapped around her. Rob settled in for a long night, while I went in to get a little sleep before spelling him at 4:30 the next morning. He had to work the next day, but I didn’t have anything pressing for work – so I would take her for the day Friday. It was a long night for Rob. He got a few winks dozing on the hay bales next to Bell, but the one time he went inside for more than a couple minutes she dragged herself out of the nook and was lying on her side in the middle area – crying – when he got back. 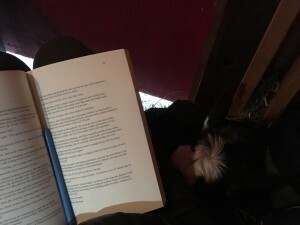 So I collected my kit – reading light, book to edit, snacks – and settled in for goat duty while Rob headed off for work on half an hour of sleep. After some experimentation, I established that Bell and I were both happy if I sat next to her, against the hay bales. It gave her a sense of herd, and it gave me the sense that I was doing something useful. And a backrest. When I had my breakfast – hot cereal – I offered her the last bit, and she ate it with every evidence of enjoyment. That was encouraging, so I went in and made some rolled oats with lots of hot water, so that she would get some fluid as well. She took that as well. All very encouraging. Eating had been one of the vet’s criteria for bouncing back. I caught up on social media and did some editing. Every hour I popped inside for a few minutes to make sure nothing was blowing up at work. All seemed to be going well . . . but by noon she still hadn’t stood up. Worse, she had tried, and every time she did she would scream and subside shaking, and pant for the next ten minutes or so. So around noon I gave the vet a call. 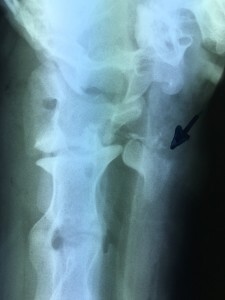 He said he would come by to take X-Rays around 3. That way we would have a better sense of things going into the weekend. Fortunately Rob was on the early shift, and was there for the vet’s visit. The vet had a nifty portable rig. He would position a plate under Bell, and then pass a hand-held machine over it to take the X-Ray. No digital processing, though – we’d have to wait for the results. In the meantime, he wasn’t sure whether she would be ok or not. It was the dreaded “not bouncing back, but not in dire straits” gray area that he had warned us about. She might just be very sore. Or it might be a more serious issue. His advice was to keep her quiet, but he didn’t think we needed to keep sitting out with her, as long as she was pinned in. She wasn’t about to keel over. He gave us some more shots to give her over the weekend, and left us feeling generally optimistic. Two hours later, the vet called back. The X-Rays were done. Her neck was broken. He would be out in 45 minutes to do the necessary. Bad news, clearly. I was a little surprised it was so cut and dry. After all, Bell was eating, and apparently there’s some gray area with a broken neck. Sometimes they can heal, although it’s a pain for all concerned. We went out to spend the last stretch of time with Bell. We fed her treats, and sat with her. When the vet arrived he showed us the X-Rays, and his certainty made sense. One of the large bone spurs from her vertebrae was snapped off, and out of place by a couple inches. The vertebrae was at an odd angle. This wasn’t just a broken neck. It was a badly broken neck. Bell should have been dead eighteen hours ago. But she had somehow made it, and her spinal cord hadn’t been severed – so she could eat – but it was pinched enough that she couldn’t stand. This wasn’t an injury that a goat could come back from. So we said our goodbyes, and the vet did the necessary – first something to knock her out, and then a shot to the heart to stop it cold. No more suffering for Bell. We buried Bell in a nice spot by the woods. Our smallest, sweetest goat was no more. We could take some comfort in the fact that we made her last eighteen hours as comfortable as possible. But we couldn’t just mourn. Bell’s broken neck confirmed Rob’s initial guess. Cougars latch onto their prey’s neck, both in the initial attack and to drag their prey away. So, we had a cougar. 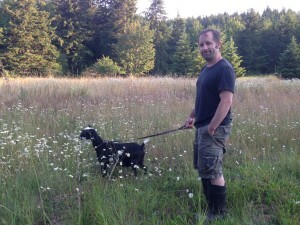 We live a couple miles outside of Port Angeles, and to most people our neighborhood would look like country. In the last couple months our life has really been feeling like life on the farm. In a lot of ways that’s good: gardening, fun critters, neat projects. In some it’s bad: predators, inclement weather, failures of various sorts. In the next few posts I’m going to record some of the ups and downs of our life in the (almost but not quite) country.